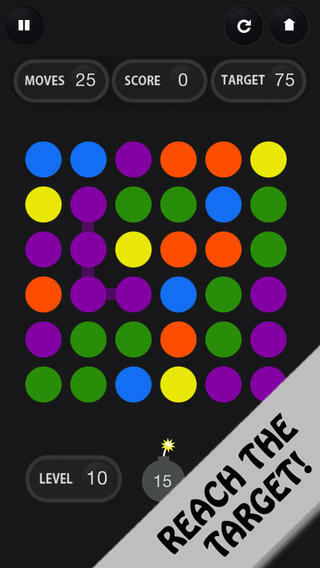 Spanning 75 challenging levels, Best Dots is a new iPhone Game developed bySuren Hakobyan. Just released on December 26, this matching game is lots of fun! The mechanics of Best Dots are pretty straightforward. 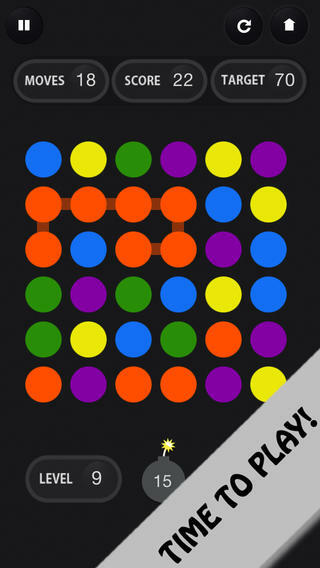 You’ll need to drag the various dots around the screen, linking chains of dots of the same color together. Onceyou reach the “dot goal” needed to clear a level, you can move forward. As the game progresses, you’ll find it gets harder to reach that dot goal. There is a bomb power-up that you can use to clear away a single dot, making it easier to link longer chains. There are only 15 bombs, however, so you’ll need to be parsimonious with each bomb and choose the right time to deploy it. More bombs can be purchased for $1.99 via IAP. Another IAP lets you get rid of the ads, which is nice. The game boasts an excellent tutorial. 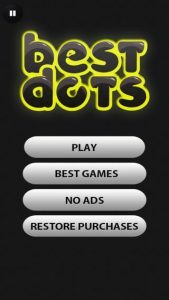 While most casual mobile gamers have probably played a game that is similar to Best Dots before, the tutorial is still a thoughtful touch. Some players might wish that the game itself was a bit more complex, with more varieties of bombs and power-ups. However, I liked the stripped down simplicity of this offering. Best dots is solid on the graphic and audio fronts. The interface is simple, but filled with inviting colors and cleanly laid out. Multiple audio controls are available, so that you can control both music and in-game sounds. 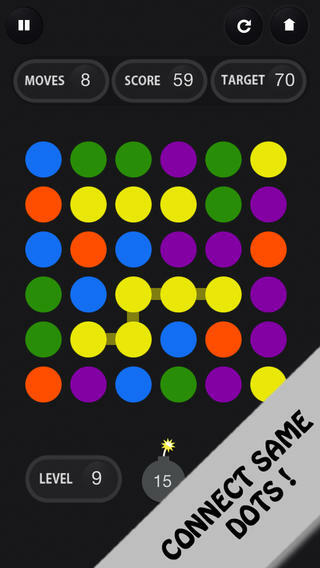 For fans of colorful puzzle games, Best Dots is a must-play title. It’s free, packed with challenging levels, and a great way to unwind or kill some time. It’s easy enough for kids to get the hang of, but tricky enough to be satisfying for adult players as well. 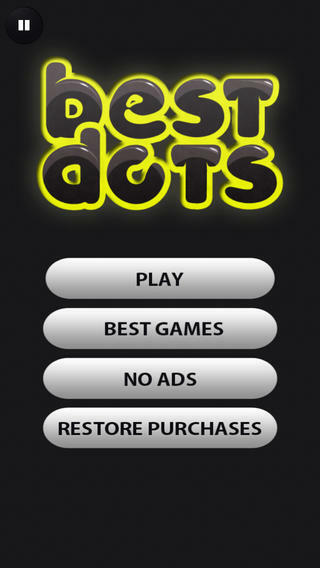 Best Dotsrequires iOS 5.0 or later. Compatible with iPhone, iPad, and iPod touch. This app is optimized for iPhone 5.